We got this table in 1988. It was our first major “fine furniture” purchase and we’ve treated it with kid gloves and obsessive protectiveness since then. I’ve always loved (and still love) the inlaid wood! But apparently it’s akin to a wedding dress with sleeves (which mine had) or parachute pants (loved those too). In other words, according to our kids, it’s “soooo 80’s” and it’s time for it to go. But until we get rid of – I mean bid adieu to – our old dining set, we can’t do much with the new one. I was asking $450, then I decreased it to $350 and now it’s a “make me an offer” deal! To my local readers... interested? Yup, Dad is Mr. Environment and I’m pretty dang proud of him for it! How many people do you know who sell a Prius because it’s not quite green enough?! "This is a time of change,” says my 81-year-young father in the article, “and I consider the ZENN ideal for Ashland's size and hilly terrain." Dad gets 35-plus miles per charge and accelerates rapidly to the 35-miles-per-hour top speed, which allows him to zip around town at the speed of traffic at a cost of about 1 cent per mile! Want to learn more about the Zenn? You can, here. I’ve been begging for a split rail fence in the front yard for three years (it was my favorite part of our original re-landscaping design), but Tom has insisted all along that the fence is pretty much the last thing to do and I’d have to wait until the rest of the yard is pretty much done. The fence, he’s said all along, is more like the cherry on the sundae or the frame around the painting. We bought the rails already “pre-punched.” They match his gorgeous garden shed pretty well, don’tcha think? He stained both the rails and the posts so they can withstand the wet Pacific Northwest weather. As he hand-finished those holes, did he run into two severed ends of what seemed to be our phone line? He might have. I’m not allowed to say. He certainly wouldn’t have gotten to this peaceful part of the project. And sure, I’d end up finishing the fence, but I’d hate it. Not love it like I love this fence. A new bridge is being built for Microsoft in Redmond! With a hundred and some Microsoft buildings in Redmond alone, there’s a whole lot of connecting to be done, too. The Microsoft campus spans both sides of the 520 freeway, both north and south (and far beyond), and for those of us who work with a variety of Microsoft business groups and in a variety of Microsoft campus locations, we’re constantly criss-crossing the freeway. I walked from my office to one of the many Microsoft cafeterias today to meet a friend for lunch and happened to catch a few shots of the construction (locations 1 – 4). Then, on the way home, I grabbed a few more (locations 5 and 6). 2.) The view across the freeway from Microsoft building 22. 3.) And back toward one of the other many Microsoft buildings (this is building 43). 4.) Yes, that’s a Microsoft security vehicle. I wonder if that car stops hackers? 5.) Do not snap photos while you drive! Only stunt drivers like me should do attempt such insanity. 6.) Snapping photos while changing lanes is especially stupid . It’ll be a nice bridge once it’s finished, but until then it’ll be noisy and dirty around the construction zone. They could at least provide us captive workers a little incentive entertainment, don’tcha think? And some photos from when Elisabeth went to Oktoberfest last year, lucky girl! A few people – NONE of them bloggers – have “warned” me about getting together with people you meet on the internet. They might be sketchy, it seems, or (shudder!) downright dangerous! I have proven those nay-sayers wrong before and I am here to prove them wrong (oh, so wrong!) again today! Lynn has been a faithful reader of my blog for about a year now. (But she doesn’t have a blog of her own – YET… hint-hint, Lynn – so I can’t provide a link.) We can’t remember how she came upon my blog originally, but she reads it daily and is one of my more faithful commenters (and you know how I love comments!). 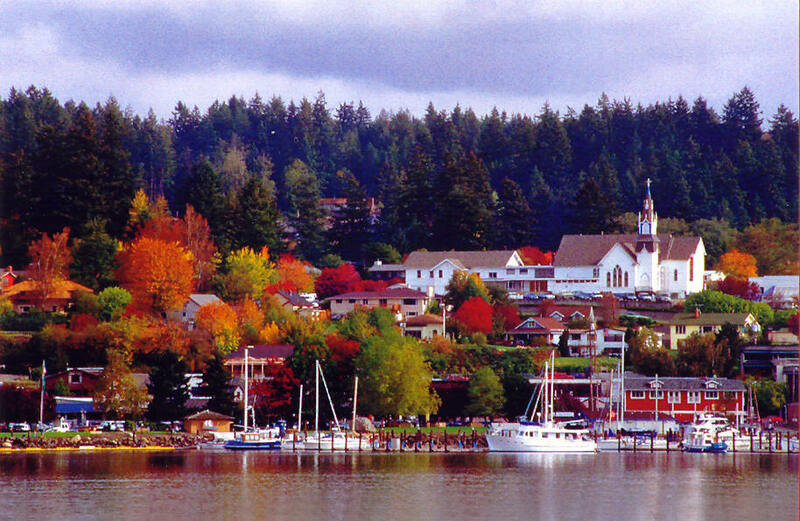 Lynn and her husband John live in the beautiful seaside community of Poulsbo, otherwise known as “Little Norway.” It’s a short ferry ride but a world away from Seattle. After our visit yesterday, I also believe that it could someday be our new home, with its beauty, its strong feeling of community and its proximity to the water and the Olympic Mountains. As we drove up to Lynn’s house, Tom asked if was nervous to meet her. “Nah,” I told him, “I feel like we’ve met many times!” And that’s what it felt like when my good friend Lynn answered the door. The internet might be a weird and dangerous place to meet people for some, but for me it has only led to great and lasting friendships! Tom and John became quick friends too, as we were given a tour of Lynn and John’s beautiful yard, complete with natural babbling stream, mini bamboo forest and fruit trees galore (we even got to take home some of their yummy peach harvest!). John and Lynn are both accomplished artists and their house beautifully showcases their talent and great design sense. As we were given a tour, John and Lynn’s son Dax and his lovely wife Melissa arrived. Dax is an accomplished musician, composer and arranger (he was the keyboard artist for NSync and toured Europe with them!) and Melissa is a zoologist – and they are both smart, talented and friendly, just like our new friends Lynn and John! …where Tizley’s Europub is located. German beer, Wienerschnitzel, and good friends… what could be better?! The evening ended too soon, but with a promise from Lynn and her family that they’d join us soon in Woodinville for a day of winery tours and wine tasting. Thank you, Lynn and John, for a wonderful evening full of fun and friendship! We’re so lucky to have met you through this dangerous and scary medium (pffffffft!) called the (shudder!) Internet! Remember my plea to bring back the wedge? Well, leave it to my obedient child to oblige! Kat IM’d me this morning (downstairs to upstairs – what has come of us?!) with a link to a haircut she was considering. I immediately encouraged her, thinking the cut would look adorable on her. Within an few minutes she’d made an appointment for 4:00 this afternoon! Gutsy kid! And she even asked me to go with her. Sweet kid! The first thing Kat did when we arrived at Gene Juarez was donate her hair to Locks of Love. I love the wedge – of course! I think it’s the perfect cut for Kat and it really showcases her personality perfectly! Don’t you? Best Project Management quote EVVVER!